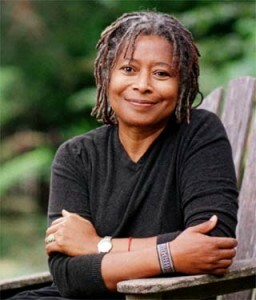 Probably most widely known for her novel The Color Purple, Alice Walker was born in Georgia in 1944. Thrown into a time when many Southern whites believed that blacks had no need of an education, Walker came through the turmoil of the US Civil Rights Movement and has been an activist all her adult life. That she had any education at all was, largely in part, down to her parents. Her mother worked long hours every week earning just $17 to put towards young Alice going to school. It was all the more remarkable in that Walker was born when the racial segregation laws were still in force which, among many others, said that the young children of sharecroppers had to work in the fields. When she was 8 years old, Alice Walker was accidentally shot with an air gun, fired by her brother. The injury left her blind in one eye and a scar that led to her being taunted and developing a certain level of shyness, something that also prompted her to start writing poetry. While the scar was later removed and she became more popular as she reached her teens, it taught her how to see people and things with a clearer eye. After winning a scholarship, she was on her way to Atlanta to study at college, finally graduating in 1965. It was a time when she was to become more active in the Civil Rights Movement. She also wrote her first book of poetry, Once, which was eventually published in 1968. Along the way she met Martin Luther King and other activists, which led to her returning to the South when she left college, moving to Mississippi where she took part in several campaigns. Whilst at college she also joined the March on Washington in 1963. Her writing career continued when she went to work as an editor for liberal feminist magazine Ms. and her first novel appeared in 1970. Another book followed in 1976 but it wasn’t until The Color Purple was published in the early eighties that she became renowned across the world as a writer. Throughout her work, Alice Walker focuses largely on the rights and struggles of black people, particularly women, in a society that is often too violent and prone to sexism and racism. Despite her success, Walker has continued to be an activist, finding herself arrested in 2003 when she attended an anti-war rally near the White House. She has also been active in criticizing the Israel ‘apartheid’ system and traveled to Gaza to deliver aid and meet with local people. It has led to her being accused in recent years of being anti-Semitic, an odd charge considering her husband is Jewish and the film of her novel, The Color Purple, was directed by none other than Steven Spielberg. Her work has often been criticized for presenting an overly harsh view of being black and female in America and when her fourth novel, The Temple of My Familiar, was published in 1989 many reviewers pointed out that it was more a manifesto rather than a work of fiction. In 2003 she came back to poetry with a collection entitled Absolute Trust in the Goodness of Earth, her first in nearly a decade. The works were inspired after the 9/11 attacks and explore our capacity for good as well as our ability to be brutal. In 2013 she produced her latest work of poetry in The World Will Follow Joy: Turning Madness into Flowers, a collection of 60 verses that yearn for a better future.